What is Business and Professional Women of Washington State? It is a non-profit organization that specializes in promoting the education and well-being of women and families through professional growth, personal achievement, and political savvy. It is a group of diverse women and men who believe in the BPW/WA Legislative Platform and support each other through programs and networking. Unlike many organizations that center around a type of career or immediate community, BPW/WA is diverse in its membership and location so it optimizes potential for growth and understanding. It offers outstanding speakers on a variety of topics. BPW/WA encourages non-members to attend Local meetings and State meetings, or to Join BPW after realizing the value of BPW/WA. We help women achieve professional and personal goals through programs, workshops, networking, and friendship. All is achieved through monthly meetings and other sponsored activities. Each Washington BPW local organization creates its own unique agenda, but all have the same objectives. Business and Professional Women (BPW) of Washington State is comprised of two separate entities. One is the BPW Federation that encompasses Local meetings, State events, leadership/training programs, networking, and a Political Action Committee (PAC). The other is the Washington State BPW (WSBPW) Foundation that awards scholarships to women in need. Together, they help women professionally, personally, and politically. To achieve equity for all women in the workplace through advocacy, education, and information. Building partnerships only with principle-centered organizations. And bless us as we part. 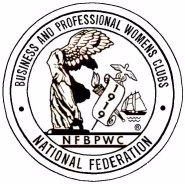 The BPW symbols, over the inscription NFBPWC are within the Golden Circle. The circle representing the globe signifies unbroken harmony and endless friendship. The components of the complete circle are illumination, vigor, tranquility, development, and victory. Torch: Symbol of light, wisdom, principle, and leadership. Wand: Winged staff of Mercury; herald of a new day for women and symbol of opportunity, equality, cooperation, healing, harmony, and power. Ship of Commerce: Symbol of activity and growth, economic independence, and adventures in friendship. Scroll: Symbol of achievement, typifies our faith, ideals and accomplishments, while denoting our obligation to the future. Nike: The Winged Victory of Samothrace; symbol of strength, progress, freedom, triumph, facing squarely the winds and waves of prejudice and all other limitations.